No one likes too much humidity. But too little can be just as irritating, especially in winter. When humidity drops too low, you might notice sore throats, chapped lips, itchy skin and sinus problems. You also might notice dry wood in your furniture—which can lead to long-term damage. To help, Coastal Heat Pumps offers a range of humidifiers that integrate with your air handler, including whole-home, fan-powered humidifiers that blow moisture vapor directly into your ducts or bypass humidifiers. Both options operate quietly with little energy use to make your home more comfortable. And your hair and clothes will be happy to know they even reduce static electricity. If your problem is too much moisture, Coastal has a solution for that too. Our dehumidifiers integrate seamlessly with your air handler to remove excess moisture from your living space — a bonus for tight, moisture-prone homes. No mess or fuss to maintain, because there are no water trays to empty. Book an in-home consultation with a Coastal Air Quality expert now. 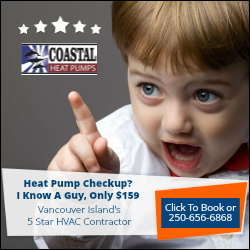 Heat Pump inspections & services starting at $189 – SPECIAL DISCOUNT OFFER: $159 Today. Call or email us for more details. Join our mailing list to receive a $30 discount off your next HVAC Maintenance Service, plus receive the latest news and updates from our team.